an ever–present help in trouble. 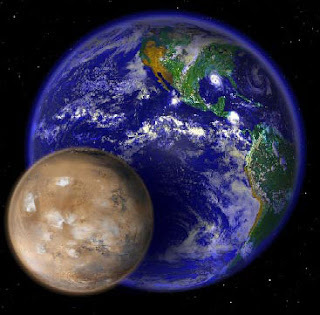 A new study says there's a possibility that Earth and Mars could collide. The study, by an astronomer named Jacques Laskar at the Paris Observatory, has to do with the erratic orbit of Mercury pulling Mars too close to Earth. The results of a collision between the two planets would be catastrophic, to say the least. Before you stow away on the next shuttle mission to the International Space Station, though, you should understand that the chance of a collision is a little less than one in a hundred. And, even if it happens, it will likely not effect you or anyone close to you. It wouldn't be for another two or three billion years. There's a good chance you won't care by then. So, frankly, there are a lot of other catastrophic things to worry about. An asteroid hitting us. Swine flu. Nuclear capability in North Korea. Sub - .500 seasons by both the Cubs and the Sox. And worry we do: If not about disasters worthy of movies with soundtracks by Aerosmith, then more mundane, run-of-the-mill catastrophes. We worry about our financial situations. We worry about health, both our own and that of those we love. We worry about political issues, and property taxes, and whether our kids' future spouses are going to blame us for the way they turned out. We worry, in short, that the seemingly secure ground we stand on will give way beneath us, that the mountains of hope and dreams we've piled up will crumble before our eyes, and that we'll be pulled under by the trouble and pain that surges around us. To me, one of the most contemporary parts of the Bible is the Psalms. When the psalmist, for instance, writes, “Nations are in uproar, kingdoms fall,” it sounds like he's read the morning paper. The Psalms are about war and peace, political intrigue, economic collapse, and the plight of refugees. They're like CNN. Except that, for CNN, the point is the news. For the psalmists, once they've listed all the things that can't be trusted – even the continued existence of the Earth itself – they want to point to what can be trusted. “God is our refuge and strength,” they affirm. When nothing else can be trusted, he can. When everything else is lost, he's there. When all the foundations upon which we've built our security and erected our monuments are rocked, God is still our “ever-present help.” While nations rise and fall, God reigns unchallenged. “He breaks the bow and shatters the spear” – which is great comfort when you find yourself on the wrong ends of those bows and spears. “We will not fear,” the psalmist writes. I wish I could affirm that in such uncompromising terms. I'm working on it. I see that it's the attitude of faith and trust, the attitude of someone who really believes that God's faithfulness is our fortress and refuge. Sometimes I do pretty well, even. But then something reminds me of the things I really do fear, the losses I would likely never recover from. The truth, of course, is that if my world ever gave away, if all that I've invested such hope in were to crumble into the sea – well, I'm not sure how I'd go on. It strikes me, though, that this psalmist wasn't really writing so theologians would have something to parse and dissect and debate from classrooms or studies or even pulpits. He was writing for people who were feeling the ground crumbling, seeing the boulders rolling down the sides of the mountains, and realizing that their worlds were about to catastrophically change. That's why Psalm 46 is popular at funerals. It speaks to those who are most in need of refuge and strength at a time when they've lost the very thing they thought they couldn't live without. When everyone else panics and runs for cover like frightened mice, God calls his people to “Be still. Hush.” Remember Jesus on the boat in the storm: “Peace. Be still?” “Be still, and know that I am God,” he says. That's foundational, you see? When everything else changes, if even the Earth itself were pulverized in a cosmic collision, God is still God. He is to be exalted and worshipped. He's with us, he's our fortress. He's our refuge, our strength, and is always there to help us in our trouble. “I am God:” That's to be treasured in our minds and hearts for the times when nothing else we know will suffice. Even in three billion years, that won't have changed. "...(Squirrels) Break in and Steal"